Little Haul with Emily De Molly, I Love Nail Polish, Zoya, a-england and Revlon - Polish This! I have another haul post for you guys today! This is going to be quite a quick one as I haven't been buying too much polishes lately, but I think the ones that I've bought and got deserved a post as they are all so gorgeous! But let's take a closer look, shall we?! So first off, I made a little order to Norway Nails and I ordered two of the so called Forces polishes from Emily De Molly, these are of course Cosmic Forces and Oceanic Forces. I also got a little gift with my order and it's a Papaya & Guava Nectar Butter Blend for hands, feet and body. The two a-england polish I bought from a Finnish online store, Cesars Shop. They had a little discount from all a-england polishes and I wanted to get these two from the newest collection. They are Rose Bower and Sleeping Palace. I have been wanting to try out these Zoya summer PixieDust polishes so badly and thankfully I got these to review from the Finnish Zoya importer NailCity. These are from left to right: Stevie, Liberty, Miranda and Beatrix. I also ordered my first I Love Nail Polish lacquers. I wanted to try out one of their new holographic polishes and I chose Blue Steel. I also had to include A Touch Of Mint to my order and then I also bought two of the Ultra Mini polishes called Sugar Blossom and Forever and a Day. The last one in this picture is Popular by Revlon and that I bought from another nail polish lover. So, what do you think of my haul? Anything you'd like me to post about or anything you'd like to have? 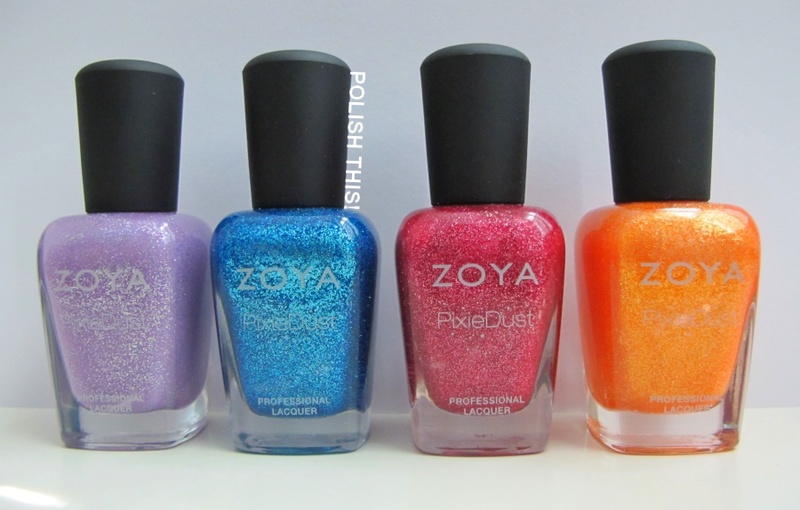 *The four Zoya PixieDust polishes were sent for me to review, for more information see my disclosure policy.